Chiang Mai, Thailand’s largest and most Northern city, is a hot destination for those looking to experience the serenity, natural beauty and abundance of culture that the North has to offer. 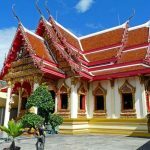 For backpackers and those on a budget in general, there is certainly no lack of accommodation in Chiang Mai, but it can be overwhelming to choose, not to mention misleading when it comes to pictures and reviews. To make your decision a little easier, I've compiled a list of the 21 best Chiang Mai guesthouses. Prices will range from backpacker (1-8 USD), mid-range (9-15 USD) and flashpacker (15-25 USD). There's something here for everyone, and best of all I've vetted them all; checked out the facilities, hygiene standards, location and more. Facilities: Free wifi in all rooms. Some rooms have balconies. Luggage storage services. Air conditioning is available in some rooms. Safety deposit box. Attached restaurant. Drying rack for laundry. A laundry service is available too. This highly rated guest house also doubles as a hostel, if you’re staying with a group and would like dormitory sleeping. 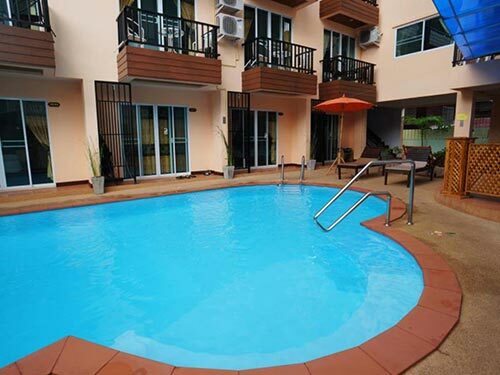 The property is quite close to Chiang Mai gate and the accompanying market, as well as steps away from the city’s Saturday Night Market. Famous temple, Wat Chedi Luang is a mere 700 m walk away. The residence is family owned and is quiet and clean. 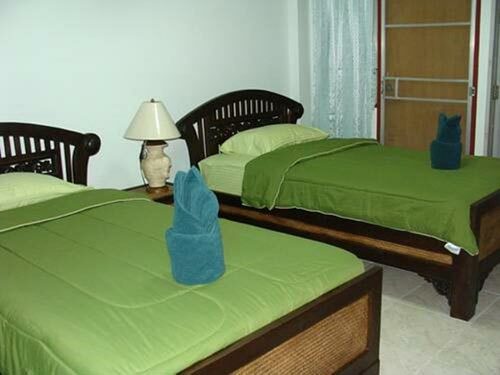 Facilities: free wifi in rooms, bicycle rental, luggage storage, air conditioning, towels, free breakfast, tour booking. 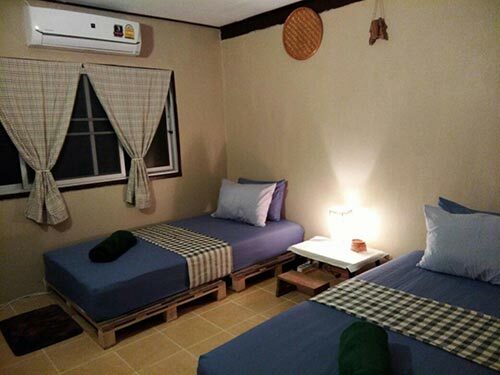 This excellently reviewed guesthouse has hostel-like dormitory style rooms, as well as private rooms. It is in the center of the Old City, quite close to attractions like Wat Si Koet temple, the Three King’s Monument, Tha Pae Gate, Wat Muen Nguen Kong and the Chiang Mai City Arts & Cultural Centre. The facilities are well cleaned, and staff is friendly and accommodating. Facilities: free wifi in all rooms, 24 hour security, daily housekeeping, laundromat, complimentary tea, towels, scale, lockers airport transfer, shuttle, bicycle rental, car park, vending machine, atm, safety deposit boxes, luggage storage, smoking area, dry cleaning. Visitors recommend Old Town Place because of its friendly staff and clean facilities. 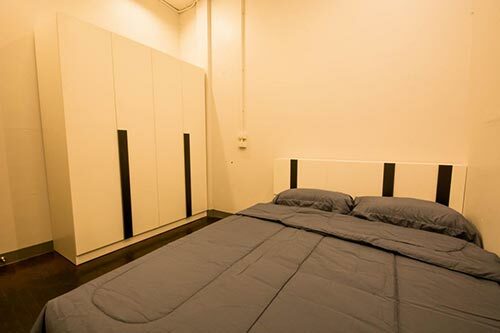 The rooms are also quite new. Old Place is located quite close to Wat Chiang Yuen Temple, Wat Chomphu and is an easy walk to other attractions in the Old City. It is in close proximity to North Gate food markets and Tha Pae gate, as well as the Sunday Walking Street. If traveling with a group, dorm-style sleeping accommodations are available. Facilities: free wifi, car park, car rental, bicycle rental, tours, currency exchange, gift shop, laundromat, luggage storage, daily housekeeping, family room, 24 hour check in, air conditioning, bottled water, refrigerator, tv, hair dryer, closet, towels. 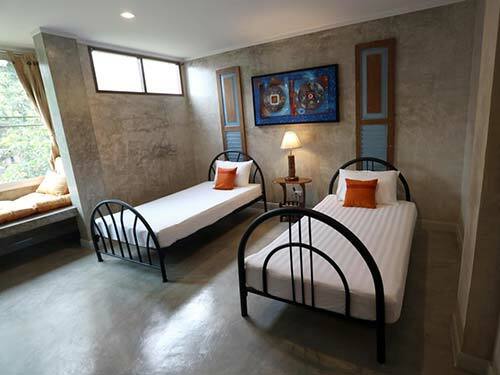 Labeled as ‘clean’ and ‘pleasant,’ 68 Guest House is a 10 minute drive from Chiang Mai’s Old City and the attractions there. There is a golf course located within 3 km of the guesthouse, as well as a playground for families with children. It is a great value, and is nicely situated along side the Ping River. Facilities: free wifi in all rooms, car park, bicycle rental, car rental, fitness center, garden, tours, daily housekeeping, dry cleaning, laundry service, luggage storage, safety deposit boxes, smoking area, room service, wheelchair accessible, dog friendly, free breakfast. 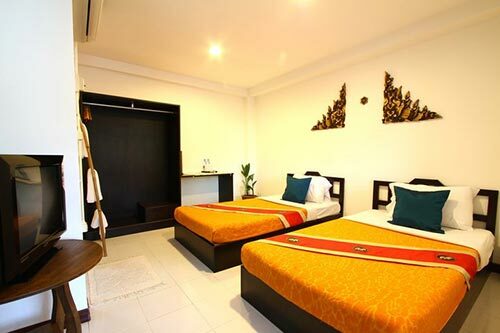 This Chiang Mai guesthouse is steps away from Wat Phuak Hong temple and Wat Prasat temple, and a quick walk from all of the attractions of the Old City. Visitors recommended Gong Kaew Huen Kum because of its peaceful garden, excellent wifi, local vibe and relaxing atmosphere. Family rooms are also available for larger groups traveling with children. The guesthouse is within close proximity to the North Gate food market and the North Gate Jazz Co-op. Visitors recommended Junior Guesthouse mostly because of its friendly and personable staff! It is located within walking distance of all of Old City’s major attractions, but the guesthouse is located on a quiet, serene street. There is a jacuzzi on the rooftop, and good restaurants are just a short walk away. North Gate attractions (the night market and the Jazz Co-op) are quite close. Facilities: free wifi in all rooms, daily housekeeping, air conditioning, tours, room service, coffee shop, concierge, luggage storage. 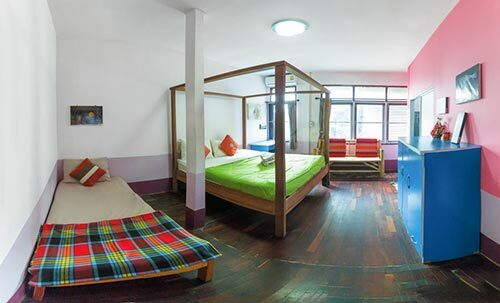 Recently renovated, the Arak Bed Bar and Hostel is both spacious and very clean. Visitors can enter building with secure swipe key. There are multiple dining options and yoga studios a short walk away. If traveling with a group, dorm-style sleeping accommodations are available. The wifi is fast and the air-conditioning is cold! Twin House is centrally situated, but nicely in a quiet little nook on the street, a short walk from wonderful restaurants and cultural attractions. The owner is noted for being extremely kind and helpful. Residents enjoy the small, charming outdoor garden area, and close proximity to the Sunday Walking Street and Night Bazaar. 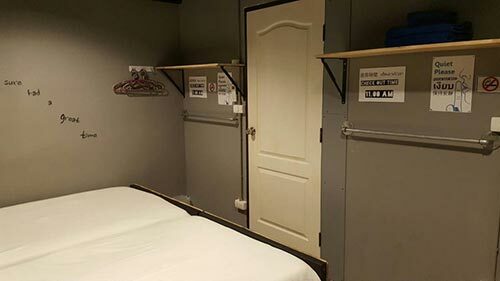 If you are traveling with a group, dorm-style sleeping accommodation is available. 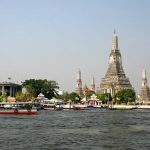 Baan Orapin is located on the east side of the Ping River, which is excellently located if you’re interested in the bars that line the riverside. 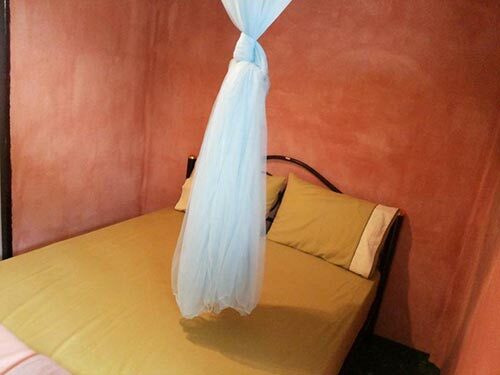 Rooms are clean and spacious and boast four-poster beds. The building is built in the northern Thai (Lanna) style, and the location is within walking distance to the Night Bazaar, Thapae gate, restaurants along the Ping river, and Warorot market. 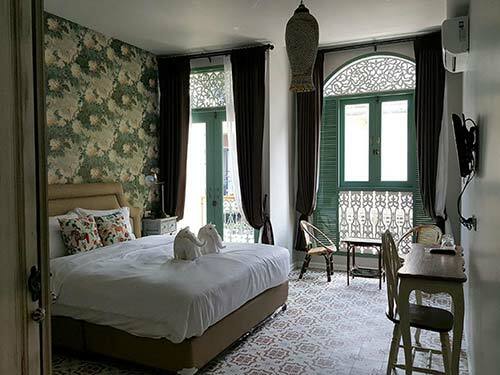 Visitors love that this excellently located boutique guesthouse is small and intimate, and that the decor feels special. Decorated in the Lanna style, it is furnished with lovely art. It also has a courtyard garden for relaxation and peace. Top Garden boasts a beautiful space for a great price! This guesthouse is only half a block outside of Chiang Mai’s Old City, and a very short walk to Tha Pae gate and the Sunday Walking Street. The outdoor pool opens at 1 pm, so hurry and dive in because it’s popular with other visitors. Rooms are clean and quiet, with 24-hour front desk service. 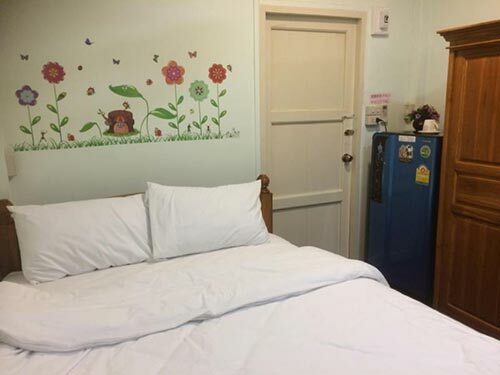 Very clean rooms, comfy beds and a pleasant owner characterize this guesthouse, which is an easy walk to a variety of good restaurants and cultural sites in Chiang Mai, including the North Gate food market, Tha Pae gate, the Sunday Walking Street and the Night Bazaar. It also boasts a host of amenities, like massage and an outdoor pool. Affordable budget rooms set in a great location make Ampawan Guest House the ultimate for a backpacker on a budget. It is located on a quiet street and is within 5 minutes of Tha Pae gate, the Sunday Walking Street and a variety of amazing restaurants and temples. 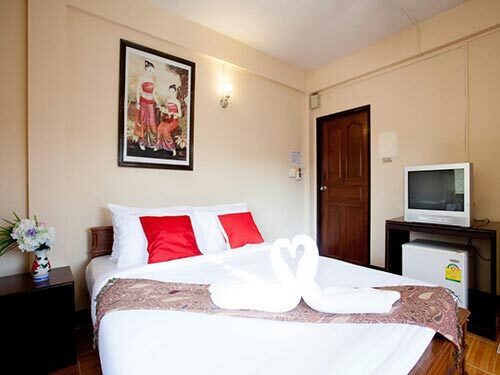 For travelers saving every penny, Ampawan is the place to stay. Baan Bua Kum is excellently located if you need to get to Chiang Mai’s international airport or airport plaza shopping center quickly. 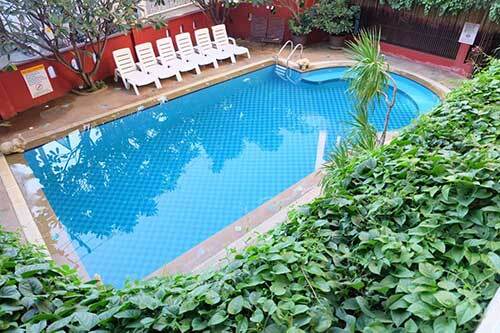 It is extremely convenient and clean, with private bungalows and a quaint garden. 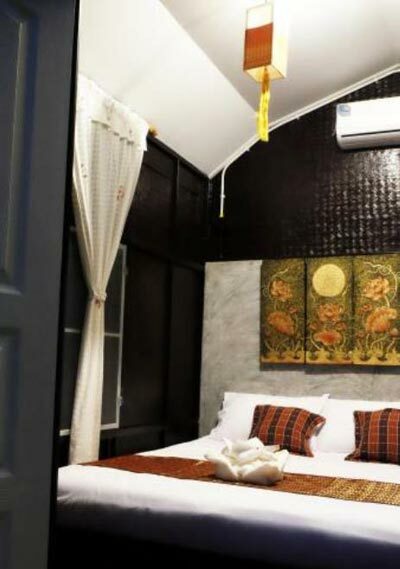 This Chiang Mai guesthouse is fairly close to interesting attractions like the Sbun-Nga Textile Museum and Tamnak Phra Mae Kuan-Im (a beautiful temple)! 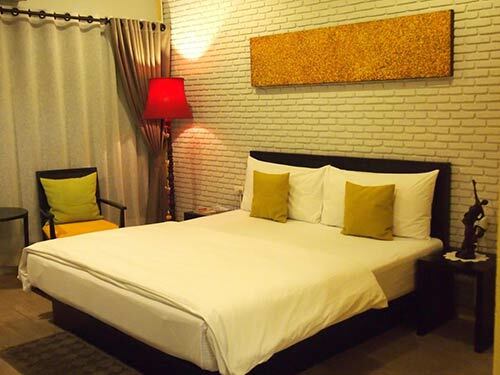 For those backpackers who would like to explore the Nimman area, La Belle Nuit is the perfect place to stay. 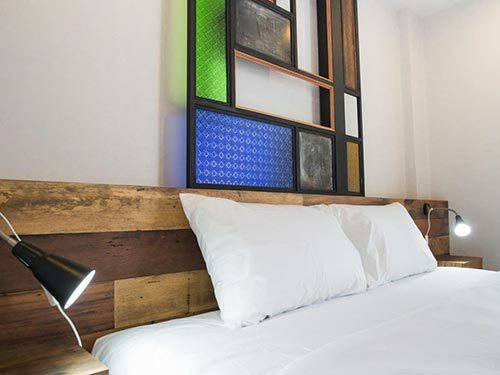 Located in close proximity to the Doi Suthep area, La Belle Nuit is a hop, skip and a jump to quirky attractions like The Museum of World Insects and Natural Wonders, and the Center for the Promotion of Arts and Culture. 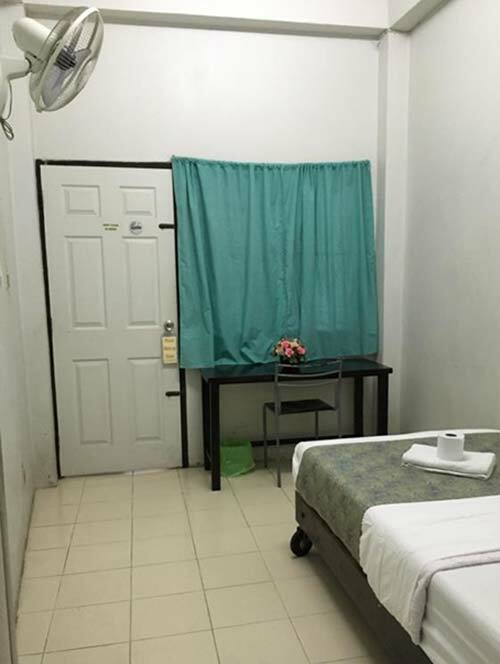 It is near Maya Shopping Center, and has clean rooms and very friendly owners and staff. Good location and great prices make Kikie’s House a great backpacker choice. Located in the Northeast corner of Old City, Kikie’s is very close to the North Gate food market, the North Gate Jazz Co-op, Tha Pae gate and the Sunday Walking Street.The staff is very friendly and will help you plan your trip. If traveling with a group, dorm-style sleeping accommodation is also available. Address: 15 Soi 5 Kotchasarn Rd. Cozy rooms and a kind owner characterize SDT Home. 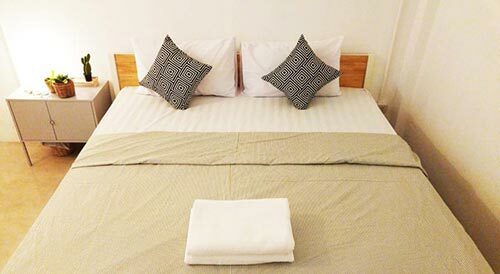 With unbeatable prices and clean accommodations, this guest house is also conveniently located between Tha Pae Gate and Chiang Mai gate, giving you access to the Sunday Walking Street, the Night Market at Chiang Mai gate and even the Night Bazaar and Wat Loi Khro and the Suriwong Book Centre. Plus, the price is pretty unbeatable! Extremely new facilities, attention to cleanliness and a kind team of staff make this guesthouse a great choice for flashpackers. Located right next to the North Gate (and its night food market), Sri Chiang Yuen is well positioned and you can easily access temples like Wat Kuan Kama and other cultural attractions. 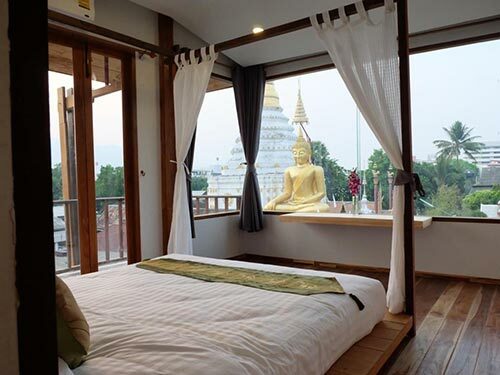 One double room gives you a fantastic view of a giant Buddha statue and will have you waking up feeling zen! 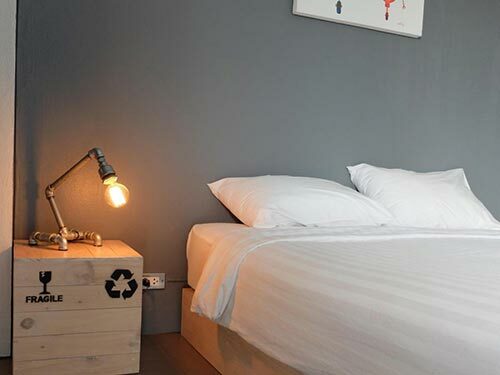 Located in a fantastic area of the Old City, near Tha Pae gate, Sleep is a fantastic value for beautiful, clean rooms and friendly service. It is located near Khum Chao Burirat House, Wat Chomphu and Wat Ou Sai Kham. If delicious pancake breakfasts are your thing, Sleep is your guesthouse! M1 is located quite close to Chiang Mai’s International airport, making it convenient for anyone with an early flight. It is quite close to a peaceful garden and has large clean rooms. Easy access to good food and the airport shopping center, in addition to the textile museum and Baan Tong Luang- a eco hilltribe village. Rooms are clean and staff is very friendly! Warmly decorated with beautiful rooms, this little bed and breakfast is a charming place to stay, and is only a quick walk to some of the city’s most beautiful attractions. North Gate is quite close, and Tha Pae gate and the Night Bazaar are only a 15 minute walk away. 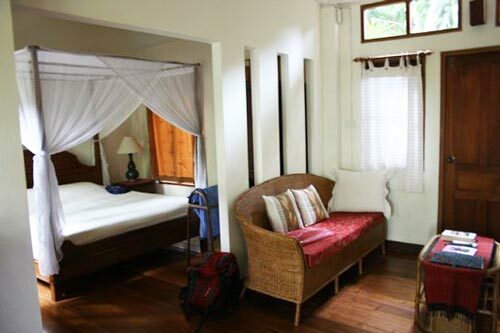 The owners are extremely welcoming and friendly, which will make your stay at Si Phum a memorable one. Now, if you can't find a guesthouse in Chiang Mai from that lot, I suggest you unpack your backpack and stay at home! We would like to introduce our guesthouse in Chiang Mai city center. It is called Rustic Guesthouse.